John L. Allen Jr. is the senior correspondent for the National Catholic Reporter and senior Vatican analyst for CNN. 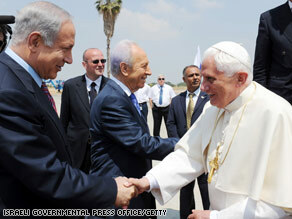 Israeli Prime Minister Benjamin Netanyahu greets Pope Benedict XVI on Monday in Tel Aviv. TEL AVIV, Israel (CNN) -- As he arrives in Israel, the focus for Pope Benedict XVI shifts from Catholic/Muslim ties, which were at the heart of his three-day visit to Jordan, to relations with Judaism. The pope comes to the Jewish state at a moment when Catholic/Jewish ties stand at a crossroads, in part related to broad historical and demographic trends, in part to the image of this particular pontiff. Last February, Benedict's decision to lift the 1988 excommunications of four traditionalist bishops, including one who is a Holocaust denier, triggered a crisis in Catholic/Jewish relations. Without directly mentioning that episode, the pope appeared Monday to try to put out that fire, offering firm promises of the Church's commitment to Holocaust remembrance and to fighting anti-Semitism. Upon his arrival at Tel Aviv's Ben Gurion Airport, in the presence of Israeli President Shimon Peres and Prime Minister Benjamin Netanyahu, Benedict honored the memory of the "six million Jewish victims of the Shoah," using the Hebrew term for the Holocaust, and said that "every effort must be made to fight anti-Semitism wherever it is found." Catholicism certainly has compelling reasons for feeling an investment in strong ties with Judaism. Jesus Christ was himself a Jew, and Christianity developed out of Judaism. The two faiths share a common set of sacred books, which Christians call the Old Testament and Jews the Torah. As a result, the relationship with Judaism will always be fundamental for Christian churches, including Catholicism. Nevertheless, several forces today are reshaping how Catholicism thinks about Judaism, in ways that make Benedict's trip to Israel critical in laying a new foundation for the relationship. For one thing, Benedict XVI is likely to be the last pope with personal memories of the Holocaust. After the Second World War, Catholicism made a new commitment to inter-faith dialogue, especially at the Second Vatican Council (1962-65), a gathering of bishops from all over the world that launched the Church on a course of reform. The pioneers of that effort were mostly Europeans who had lived through the Holocaust, and therefore had a profound personal and biographical commitment to improving ties with Judaism. Today's new generation of Catholic leaders has not had the same set of formative experiences and may not feel the same personal imperative to make relations with Judaism a priority. Second, Benedict XVI could also be the last European to hold the papacy. Over the last half-century, the demographic center of balance in the Catholic Church has shifted decisively to the global south. Today, two-thirds of the 1.1 billion Catholics in the world live in Africa, Asia and Latin America, and by mid-century that figure will be three-quarters. As Auguste Comte once said, "demography is destiny." As Catholicism becomes less a European enterprise, and more a faith centered in the global south, increasingly leadership and vision will come from Africa, Asia and Latin America. By and large, these are places without large Jewish populations, and often Catholic leaders there do not have close Jewish friends or much personal experience of Catholic/Jewish dialogue. This is not to say, of course, that Catholic bishops in places such as Africa or Asia are opposed to improving ties, but it may not loom as large in their personal priorities. Third, Islam in some ways has replaced Judaism as the top inter-faith priority for Catholicism. In part, that's a result of simple math: There are 1.6 billion Muslims in the world and 1.1 billion Catholics, as opposed to 13 million Jews, which means that at the grassroots in many parts of the globe, Catholics are far more likely to rub shoulders with Muslims than with Jews. That's particularly true in regions such as Africa. In addition, the impact of 9/11, the two Gulf Wars, ongoing tensions with Iran, and a host of other factors have collectively convinced the Catholic Church, along with virtually every global institution, to invest a much greater share of time and energy in the relationship with the Islamic world. While greater attention to Islam doesn't have to come at the expense of Judaism, this shift inevitably implies that in the Catholicism of the future, the relationship with Jews will no longer be the unquestioned priority for Church leaders that it has been over the last half-century. Finally, frustration with the Israeli/Palestinian conflict, and perceptions in some quarters that Israeli intransigence is at least partly to blame, has also reconfigured the unquestioned sympathy for Israel and for Judaism that most post-war Catholic leaders felt. Once again, this tends to be especially true in the global south, where many Catholic leaders and activists, whose countries have suffered through their own legacy of colonialism, tend to instinctively identify with the Palestinian plight. So far, Benedict XVI's papacy has suffered multiple crises in relations with Jews and with Israel. Aside from the Holocaust-denying bishop episode, many Jews were also critical of the pope's 2007 decision to dust off an old Good Friday prayer for the conversion of Jews. Israelis likewise took offense when a senior Vatican official compared Israel's incursion into the Gaza Strip to "a giant concentration camp." Despite that turbulence, in many ways Benedict XVI appears deeply committed to Catholic/Jewish ties. Prior to his election as pope, he made a speech in Jerusalem in 1994 in which he insisted that Christianity "doesn't make sense" without Judaism. In his first book as pope, Jesus of Nazareth, Benedict dwelt at length on the Jewish roots of Christianity. The challenge facing Benedict in Israel is thus to lay out a logic for making ties with Jews and with Judaism a top priority for the Catholic Church, in a way that will survive the generational, demographic, and political transitions sketched above. It's a tall order, and the clock is ticking.